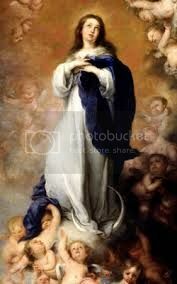 The Immaculate Conception is one of four Marian Dogma’s of the Catholic Church. A dogma is a principle that is considered by the Church to be an infallible divine revelation, a truth of the Church. The other three Marian dogma’s are: Mary’s divine motherhood, Mary’s perpetual virginity, and Mary’s assumption into heaven. Some people think that the term the Immaculate Conception refers to Christ’s conception in Mary’s womb without a human father. The Immaculate Conception means that Mary was conceived without original sin or its stain – “immaculate” means without stain. Original sin is the deprivation of sanctifying grace. Mary was preserved from original sin by God’s grace from the first instant of her existence, at the moment of her conception. The Catholic Church bases this dogma on the statement made by the Angel Gabriel when he greeted Mary by saying, “Hail full of grace! The Lord is with you.” (Luke 1:28) The phrase “full of grace” is a translation of the Greek word kecharitomene. The following video taken from "Mary, A Biblical Walk with the Blessed Mother" by Dr. Edward Sri explains Mary's Immaculate Conception and shows how this teaching is supported by Scripture.